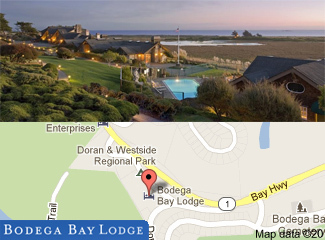 The Bodega Bay area embodies the powerful attractions of the Pacific Coast. Ocean breeze, the crashing of waves, stunning sunsets, great seafood, romantic accommodations, adventure, and relaxation. Check out photos and routes of the area's scenic drives. A scenic view along the California coastline near Bodega Bay. Beaches such as these abound for miles. The state park system maintains access trails and parking for each beach. Everything you see is public property. This means for any beach you see you will be able to park your car and walk to a secluded location. Spotlight - Dining -- Combine the fresh produce of Sonoma County, the daily catches coming in to Bodega Bay with the beauty of the coast - and you get the unique conditions that make for some incredible dining. Spotlight - Parks -- The approximately 8 miles of coast from the Bodega Bay Head to a little past Jenner is all Sonoma Coast State Beach property. Beach accesses trails and parking lots are regularly maintained. Many include a combination of restrooms, trash cans, RV and camping sites. You can stop and walk down to any beach you see from the road! Further up Highway 1 lie historic Fort Ross and Salt Point State Park. In the town of Bodega Bay there is the fun Doran County Park with its jetties (great for crabbing and fishing) and big sandy beaches.